Much thought and discussion has gone into types of blade shapes that various knives possess—and many have their favorites (the tactical Tanto blade is mine) but the way a blade is sharpened has possibly even more to do with how well a blade will cut. It will also, more importantly, determine how likely it is to retain its sharpness, all other things remaining the same. Knife blade grinds, coupled with the steel used in its construction, ultimately determines how sharp and strong an edge the knife will hold. This is one of the more common types of knife blade grinds where both the top and bottom bevels meet perfectly in the middle. The result is a nice center edge that runs the length of the sharpened portion of the blade. The sharpened sides terminate at some midpoint of the blade as opposed to taking up the entire blade to the spine. The result is a nice strong blade grind that is easily reproduced and sharpened. There is no secondary grind on this edge. A blade with a hollow grind will have two concave bevels that can extend either the full width of the blade (full hollow grind), or over a portion of its width. It is vey common that hollow grind blades have a secondary V-grind bevel on the edge. The idea of the hollow grind is to create a blade that is better-suited for filleting and separating thin materials (like skinning or deboning). Editor’s Note: Any unsharpened, but shaped portion of a blade can be referred to as a wedge. This reduces blade weight and can also be used simply for design aesthetics. Convex knife blade grinds are a double-sided convex grind where the bevel is formed by the two continuous curved grinds meeting in the middle. A full convex grind implies that the curve of the grind starts from, and takes up, the entire width of the blade. This type of grind has also been referred to as a Hamamguri, clamshell, Applesee, or Moran grind. You can get this grind by sharpening on a slack leather grinding strap or belt. The high flat grind is a flat grind that terminates at the edge. It is similar to a full flat grind except that it leaves some of the flat of the blade near the top. The edge may have a secondary V-grind or convex grind to increase edge strength. As far as knife blade grinds go, the full flat grind is fairly rare. 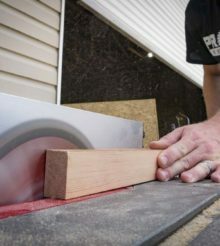 It’s similar to a high flat grind except that it extends a steady bevel all the way through the entire width of the blade (whereas a high flat grind leaves some of the flat of the blade). Like the centerline grind, the is another one of the more popular knife blade grinds. A single bevel grind, sometimes called a chisel grind, is like one half of a Scandi or high flat grind where one side of the knife is completely unsharpened while the other side has a flat grind. The result is a sort of chisel effect. This isn’t so much of a grind on its own so much as it’s a half version of other flat grinds. A single bevel grind may also be made with a single hollow ground edge as well.